One of the primary reasons I see my students and clinicians contorting over the patient is due to poor control of the occlusal plane when treating the upper arch. 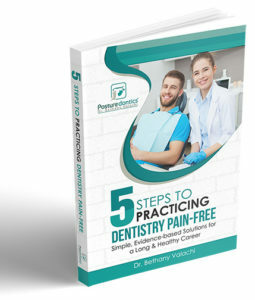 This is Step 3 of my 10-Step Patient Positioning Sequence, and one of the most important concepts in dental ergonomics: when the occlusal plane of the upper arch is in front of the vertical, it pulls the dentist into a forward-leaning posture. To maintain optimal posture, the occlusal plane of the upper arch must be 20-25 degrees behind the vertical. 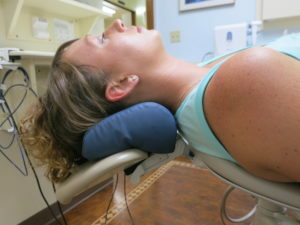 This is most easily achieved with a double articulating headrest, however most dentists and hygienists do not angle the double articulating headrest steeply downward for risk of causing the patient discomfort. Many of these headrests are not sufficiently cushioned on the edge and can cut into the patient’s occiput. surprising amount of reclining without objection! 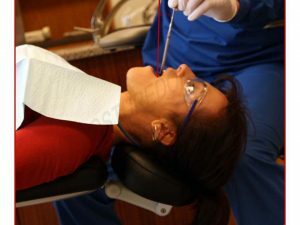 The key product to do this is a low-profile dental ergonomic headrest cushion that is ideal for use with double articulating headrests. Many are familiar with the larger headrest cushions that have been around for years (which are ideal for use with a flat headrest) but they are too large to use on most double articulating headrests, especially when treating the upper arch. Check out the new low profile headrest. 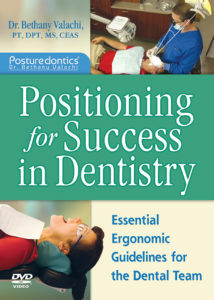 CE Video course, “Positioning for Success in Dentistry”.